Yes, that is early adopter Audrey Hepburn in an impeccable Child’s Pose. This resting posture is also referred to by its Sanskrit name, Balasana (bah-LAHS-anna), and can alternately be called Baby Pose (not to be confused with Happy Baby Pose). It relaxes and releases the lower back while gently stretching the thighs and hips. 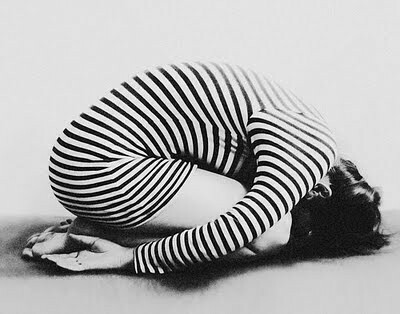 Practicing this asana stimulates digestion, increases bloodflow to the head. relieves pressure on the female reproductive organs and helps with menstrual cramps. It is also a posture of surrender, helping to cultivate the attitude necessary for a deeper practice. To begin, kneel down, sitting on your heels with your spine straight and your knees and feet together (in Vajrasana). Inhale deeply to center yourself. Exhale as you bend forward and place your forehead on the floor. You can put your palms on the ground in front of your knees and engage the arms to help support the body as you lower it, if necessary. Once there, place your hands on the floor beside your thighs, palms facing upward. Release your shoulders down toward the floor and feel the weight pull your shoulder blades wide across your back. You can also choose to extend your arms straight out in front of your head with palms on the floor, or place the palms together in prayer mudra for a Kundalini variation called Gurpranam. Rest here, taking long, deep full breaths. Feel your lungs expand against your thighs, and increase your respiratory awareness. To come up, first bend your elbows, bringing your palms to the ground underneath your shoulders. Lengthen your torso and engage your navel center as you slowly lift yourself back up to a kneeling Rock Pose. The best way to discover your best Child’s Pose is to maintain an inward focus as you try them all out. Your body will tell you which version will serve you best in the present moment. This entry was posted in Yoga and tagged asana, basics, child's pose, poses, video, yoga. Bookmark the permalink.